Here are health benefits of beer that may be surprising to you. We bring the list on the occasion of National Beer Lovers Day 2018. NBLD is celebrated on September 7, every year. It takes year to become a good brewster. But, you can continue to focus on drinking beer. The benefits of drinking beer include anti-cancer properties, a reduced risk of cardiovascular diseases, increased bone density, the prevention of dementia and coronary disease, aid to the digestive system, anti-aging properties, as well as treating diabetes, gallstones, kidney stones, osteoporosis, and hypertension. 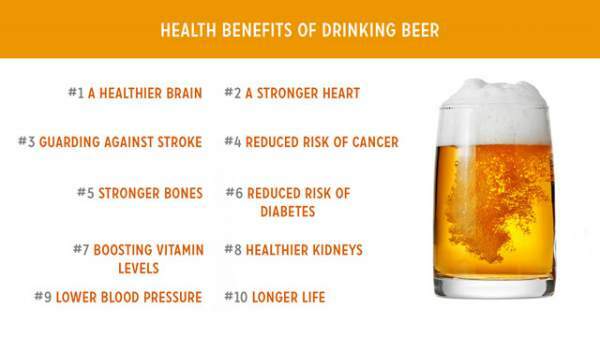 Here is the list of benefits of drinking beer. Consuming beer daily reduces the risk of cardiovascular disease. Moderate intake increases bone density. It in turns helps in reducing the risk of fractures and osteoporosis. Dietary silicon, found in it, is important and helps in the growth and development of bone and connective tissues. Prevents anemia as it is a source of vitamin B12 and folic acid. B12 helps in normal growth, concentration, and a good memory. Several studies link moderate alcohol consumption with a 30 percent reduced risk of type 2 diabetes. It contains xanthohumol, a powerful antioxidant known to have anti-cancer properties. Perhaps one of the most remarkable beer health benefits is its ability to protect against Alzheimer’s. Prevents gallstones as affects the cholesterol levels and decreases bile concentration. It has soluble fibers which help the heart and in digestion. Drinking too much beer is dangerous to health. It can negate all beneficial effects. Check: Happy Engineers’ Day Images. Stay tuned to TheReporterTimes for more health updates.